Steel Draft recently dedicated a new mural in its Conference Room titled “Tools”. The mural was painted by Steel Draft employee, Poppy Albracht. 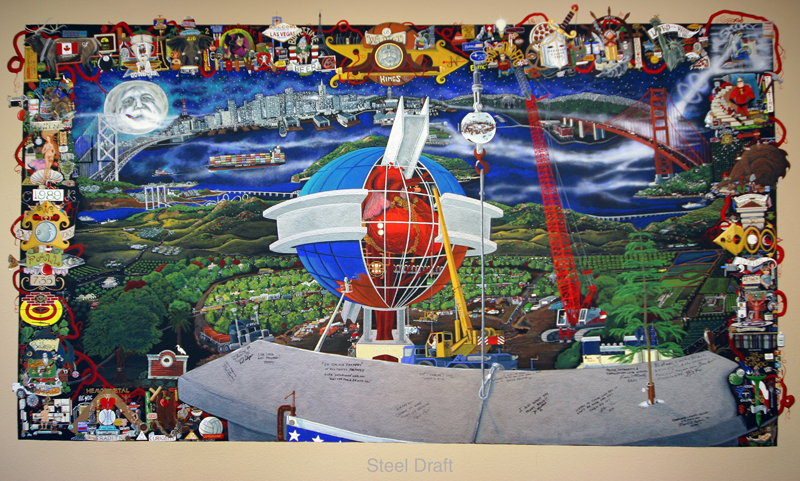 The Company logo is featured in the center of the painting, which suggests that an organization is never truly completed, but rather, is an ongoing work in progress. Within the logo, a living heart is represented which in turn, pulses the life blood of the company to all of its individual people (Owners and Employees) who are also featured around the perimeter of the painting. Perhaps it is the collective “heart” of an organization that makes one successful. The artwork symbolizes the company spirit and its history along with the people that will make it happen for many years to come.